Pancakes are a favorite breakfast choice the world over, but what if I tell you they can be made healthy, full of essential protein and micronutrients too! 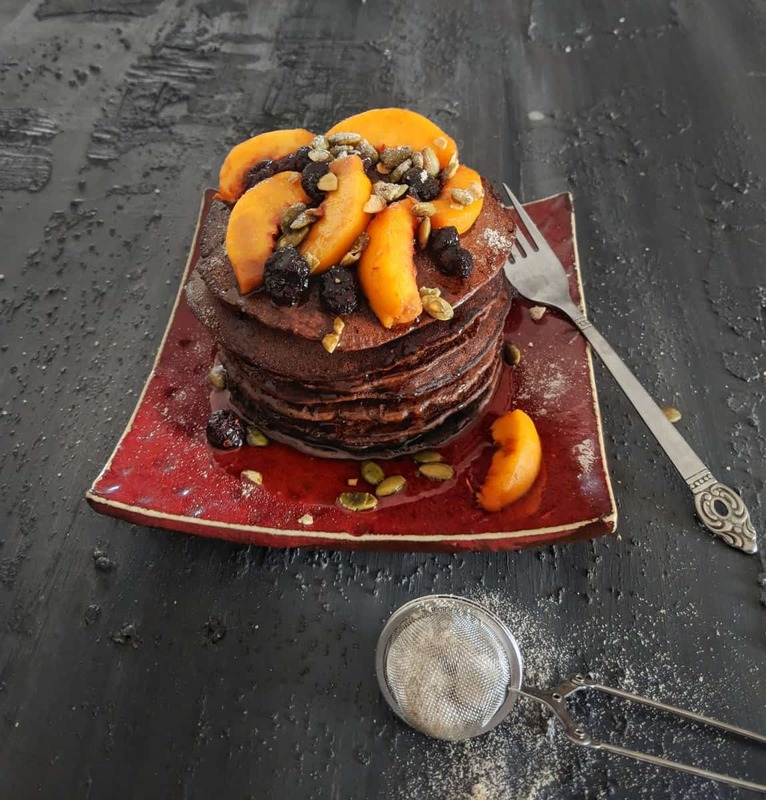 These chocolate-y fluffy pancakes are made from a mix of wholegrain flours and whey powder, hence proving worthy of a post-workout brekkie that keeps you fuller and satiated for hours. Really simple to assemble and can be made in advance and frozen too, for quick breakfast option on work mornings! I’m a terrific fan of all things pancakes and crêpe, but the all-purpose flour aka maida used as a base at most eat-outs didn’t help my middle or ease the guilt in my mind. While healthy flour mixes are available in stores, I couldn’t find a readymade mix that didn’t have ingredients like heaps of sugar/ maltitol/ maize starch or soy starch in them. I’d rather have an occasional pancake made from refined flour rather than those made from these store-bought versions loaded with sodium and starches and other undecipherable ingredients. I like to make my own flour mixes for most of my recipes – whether it is for cakes, muffins, cookies breads and pancakes – for greater control on nutrition. Change the flours as per yours and your family members’ preferences, and these can easily become a lunch box option too. You can use whole-wheat flour, oatmeal or a combination of both if you wish to avoid refined flour. Want a gluten-free mix? Use spelt flour/ employ millets like ragi (finger millet), samai (little millet), bajra (pearl millet), jowar (sorghum)/ besan or chickpea flour. It’s as easy as that! 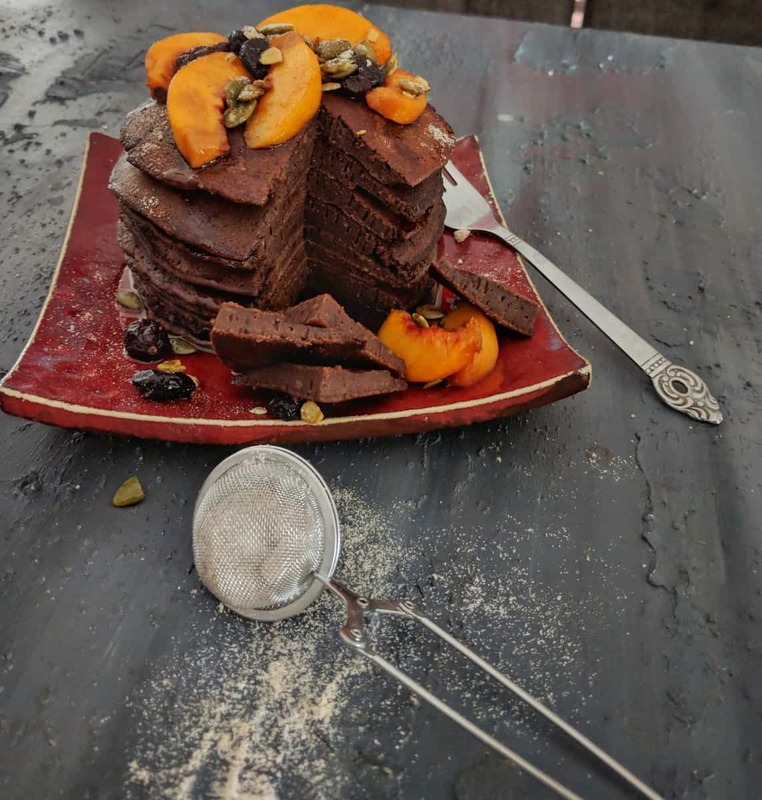 While these flours have more protein and fiber content, you can add some whey/ soy/ casein protein supplement for additional protein, making these pancakes ideal for a post-workout meal. I used stevia extract for natural sweetening that adds negligible calories. The key to making these pancakes airy and fluffy is in addition of baking soda and eggs. If you are a vegan, substitute with soy milk and it works just as fine (I’ve tried it for my vegetarian family members). Also, play around with your toppings – I’ve paired my pancakes with fresh peach slices, toasted pumpkin seeds, cranberries, wheatgerm flakes and glazed with honey, and it tastes divine! 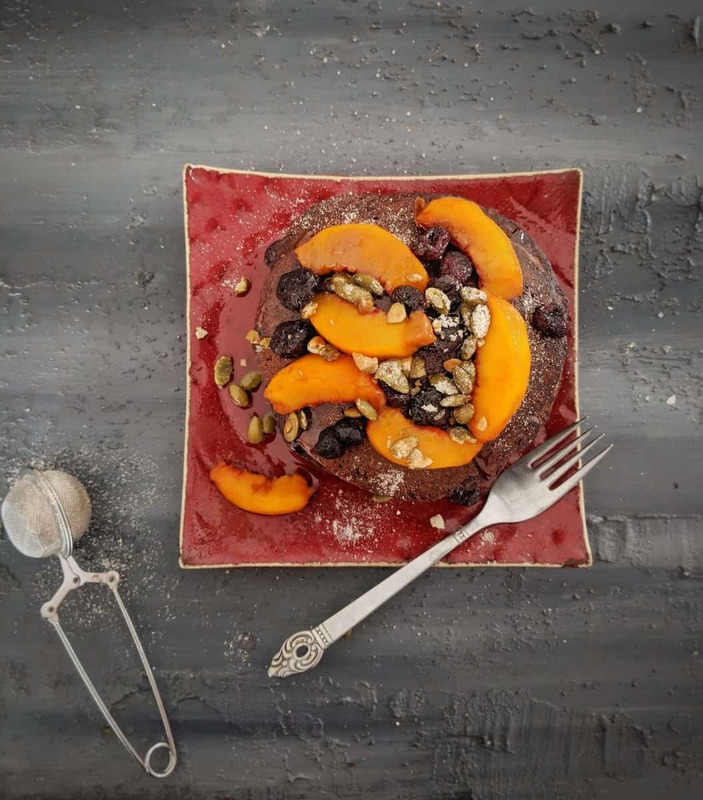 You can also try your hand at Kissir and Tsemik (Buckwheat Pancakes with Yogurt Chutney), Healthy Buckwheat Protein Pancakes or Healthy Homemade Wholewheat Pizza. I’d love to see the pictures and hear your experience if you do try my recipe: do tag the picture as #fitfoodiediary or @fit.foodie.diary . In a bowl, crack the eggs, add buttermilk, vanilla extract, sugar/ stevia and whisk together until fluffy. Add the flour mixture, cocoa and whey powder slowly while whisking continuously. Once everything is combined well, add salt, cinnamon powder, baking powder and whisk well. Add more milk or water to adjust the consistency. The batter should be smooth, thick and lump-free, but you should be able to pour it onto the pan/ griddle. Heat a non-stick pan/ griddle and grease with little oil or butter. Pour a little amount of batter onto the pan surface, taking care to not spread it much. Cook on medium flame until bubbles appear on top. Flip and allow the other side to brown too. Transfer into a casserole or plate. Stack pancakes and drizzle honey or maple syrup on top. You can serve these with accompaniments of your choice. Ensure that your baking powder is gluten-free if you are gluten-sensitive. Avoid usage of Stevia if you find its taste peculiar/ if your whey or casein supplement is sweetened already/ if you’re going to drizzle honey or maple syrup on top of the pancakes. You can freeze these pancakes in a Ziploc bag for up to a month, separated by cling-film sheets or baking sheets for easy removal. Thaw them naturally or in microwave before eating.